The United States and the world lost a warrior for freedom and democracy with the passing of U.S. Senator John Sidney McCain, III on August 25, 2018 at the age of 81 from brain cancer. McCain, the son and grandson of four-star U.S. Navy admirals, held many roles in American life. He was a naval pilot, a Congressman and Senator from the State of Arizona for over three decades, the Republican presidential nominee in 2008, and a prisoner of war under the communist North Vietnamese regime during the Vietnam War from October 1967 – March 1973. 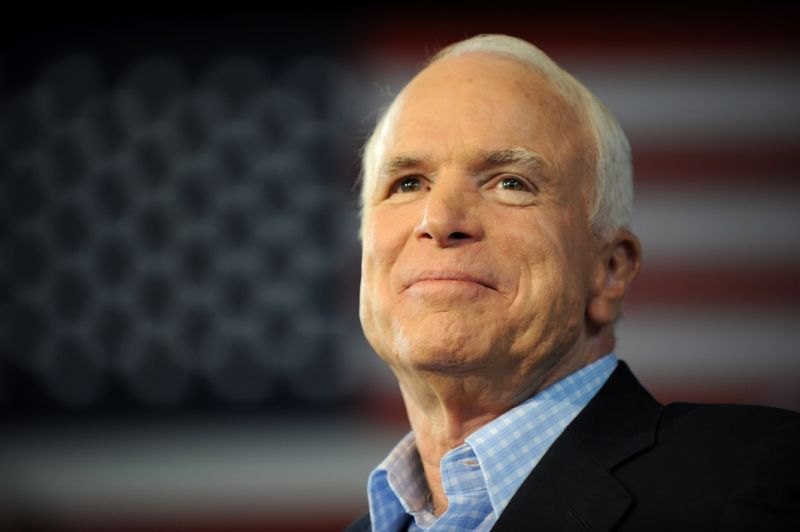 Born on August 28, 1936 in the Panama Canal Zone to a family steeped in military tradition and honor, McCain’s father, John S. McCain, Jr. served as Commander of the United States Pacific Command during the Vietnam War and his grandfather, John S. McCain, Sr. served as a commander in the Pacific theater during World War II. For college McCain attended the U.S. Naval Academy like his father and grandfather before him. After graduation McCain became a naval pilot and served on the USS Intrepid and USS Enterprise. On October 26, 1967, McCain was shot down by the North Vietnamese, bayoneted, and suffered two broken arms and a shattered leg. He was taken to the infamous Hanoi Hilton where he spent two years in solitary confinement. Even though he was offered an early release since his father was the commander of U.S. forces in the region, McCain refused unless all the Americans that were captured before him were also released. He was beaten and tortured regularly and as a result could never raise his arms over his head ever again. McCain was released on March 14, 1973 after five and a half years of mistreatment and pain. After going through rehabilitation and physical therapy McCain became a Navy liaison to the U.S. Senate, the place he would spend over three decades of his life advocating for prisoners of war and veterans like himself. After serving as a navy liaison where he worked for a future Senate college and Vice President, Joe Biden, McCain was elected to the U.S. House of Representatives in 1983 and four years later was elected U.S. Senator for the State of Arizona, succeeding the legendary 1964 Republican presidential nominee Barry Goldwater. After succeeding Goldwater, McCain became known as a maverick in the world of national security and military affairs. He went on to serve as Chairman of the Senate Armed Services and Commerce Committees and was also a member of the Senate Select Committee on POW/MIA Affairs with then Massachusetts Senator and fellow Vietnam War veteran John Kerry, also another future presidential nominee. In 1995 McCain supported Democratic President Bill Clinton’s efforts in restoring diplomatic relations with Vietnam. During his time in the Senate, McCain would become friends with people from the other side of the aisle like Senators Edward M. Kennedy, Gary Hart, Joe Liberman, William Cohen, and future Vice President Joe Biden. Aside from national security policy, McCain also fought for domestic changes like campaign finance reform with Democratic Wisconsin Senator Russ Feingold in 2002 and immigration reform in 2007. In the years following the 2008 election, McCain continued serving Arizona and the nation he loved. In July 2017, McCain was diagnosed with glioblastoma, the same type of brain cancer that took the life of his Senate colleague Edward M. Kennedy in 2009 and former Vice President Joe Biden’s son, Beau Biden, in 2015. In his farewell letter, McCain stated “I have loved my life, all of it. I have had experiences, adventures and friendships enough for ten satisfying lives, and I am so thankful. Like most people, I have regrets. But I would not trade a day of my life, in good or bad times, for the best day of anyone else’s.” McCain is survived by his wife Cindy, seven children, five grandchildren, and his 106-year-old mother, Roberta. After his passing, McCain laid in state at the Arizona State Capitol in Phoenix on August 29th, which would have been his 82nd birthday. A memorial service at North Phoenix Baptist Church was held the next day and included tributes by several people including former Vice President Joe Biden. On August 30th, McCain laid in state in the U.S. Capitol Rotunda and a ceremony was held with remarks by Vice President Mike Pence, Senate Majority Leader Mitch McConnell (R-KY), and Speaker of the House Paul Ryan (R-WI). Another memorial service was held at the Washington National Cathedral on September 1st which was attended by over 3,000 prominent Americans and McCain family members and friends. Remarks were given by the two men that defeated McCain in his quest for the presidency, former Presidents George W. Bush and Barack Obama. Other remarks were given by his daughter Meghan McCain, former U.S. Secretary of State under Presidents Richard M. Nixon and Gerald R. Ford Henry Kissinger, and former Senator Joe Liberman (D-CT). McCain was buried in a private ceremony on September 2nd at the U.S. Naval Academy in Annapolis, Maryland, unlike his father and grandfather who are both buried at Arlington National Cemetery.